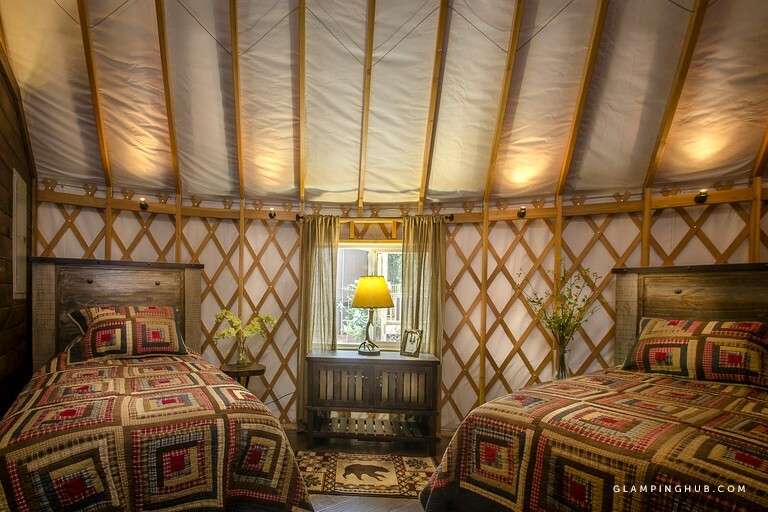 Our family had a fun yurt adventure in a gorgeous setting! 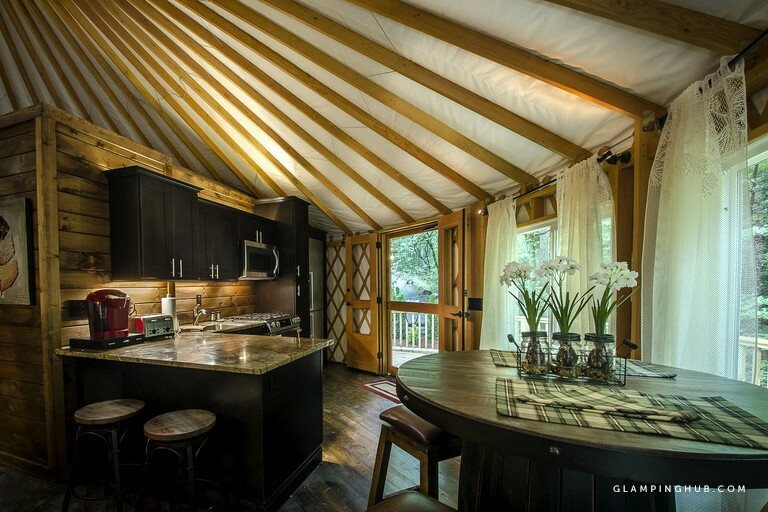 Serenely situated by a woodland creek, this enchanting yurt in the Topton, North Carolina, area of Nantahala National Forest near Lake Nantahala is a unique rental that can provide four guests with an opportunity to experience what a glamping getaway is all about: a chance to live in nature without sacrificing comfort, and to live in luxury without sacrificing connection to the outdoors. There are two bedrooms and one full bathroom. 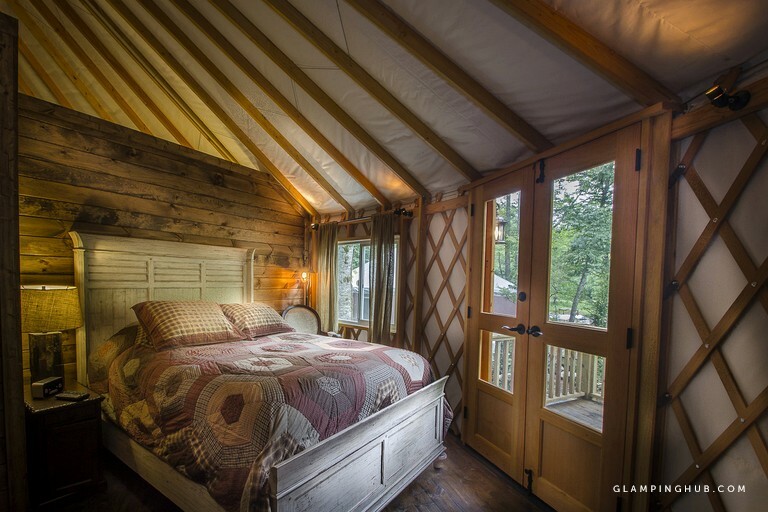 The first bedroom has a queen-size bed and a French door that opens to a porch. The second bedroom has two full-size beds and ample space. 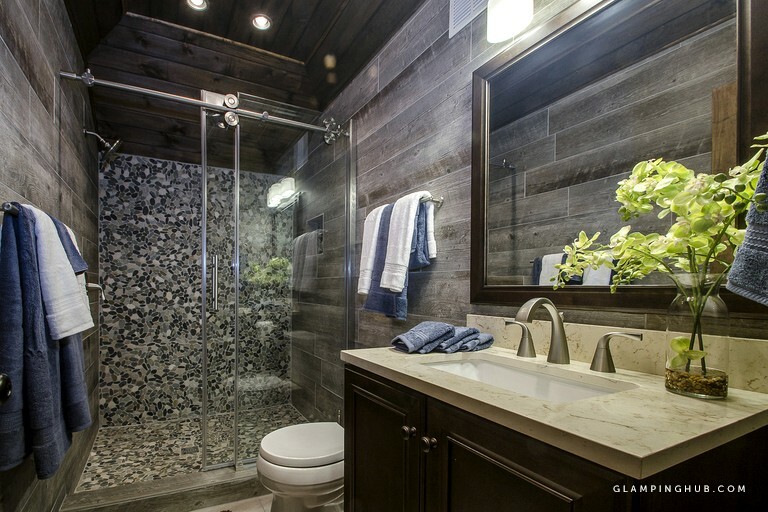 In the bathroom, guests will find an elegant sink, a large mirror, a spacious toilet area, and a generously sized shower, harmoniously enclosed by wood paneling on both the walls and the ceiling. Linens and towels are provided. In the living room, guests will find an armchair, a coffee table, and a couch flanked by side tables and lamps, all tastefully selected and in keeping with the overall décor. Adjoining the living room, the fully equipped kitchen comes with an oven, a stove, a toaster, a coffee maker, a dishwasher, a refrigerator, and plenty of cabinets and granite-top counter space. Wide enough to eat at and cook on at the same time, the main section of the counter doubles as a bar, complemented by a pair of stools. In between the kitchen and living room spaces, guests will find a wooden dining table bathed in natural light from the many windows of the adjacent wall. 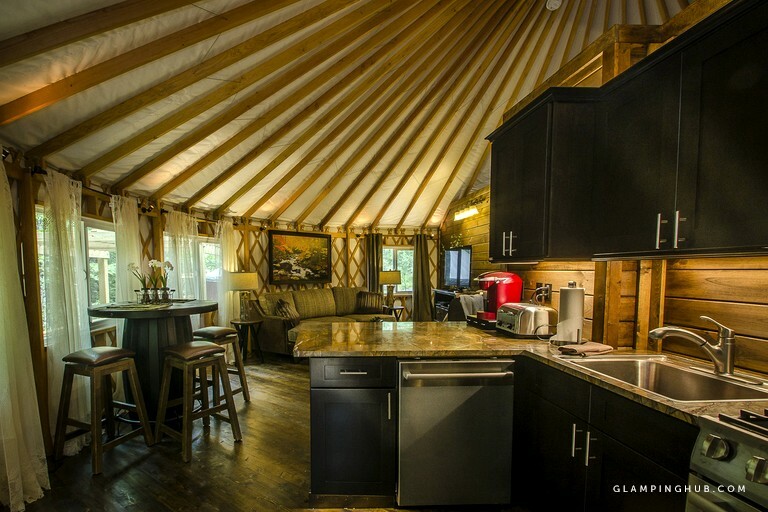 A range of modern amenities and comforts are available in the accommodations, including Wi-Fi, central heating, and local phone service in the cabins, central air conditioning in the yurts, and televisions in both the cabins and yurts. 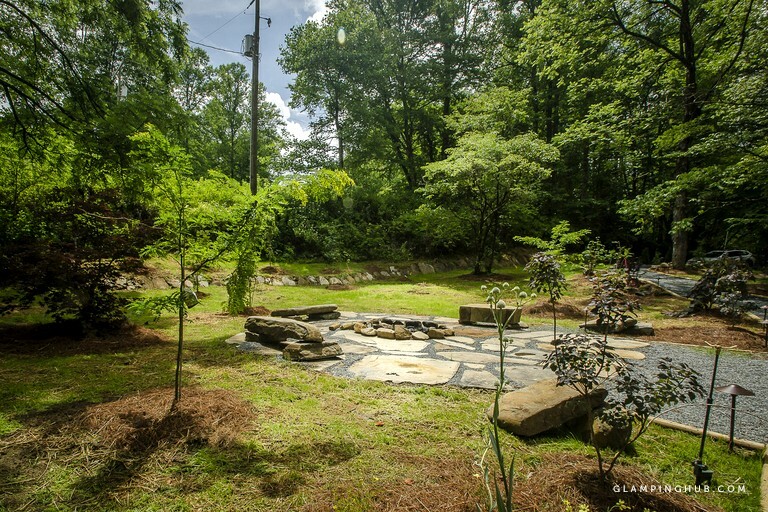 Outside, visitors have access to volleyball and horseshoes for recreation, as well as fire pits and hot tubs for relaxation. The site also features a cafe and grill, an outdoor supply store, and a marina from which watercraft rentals, tours, cruises, guides, and drivers are available. Whether visitors are hungry for outdoor adventure, boating, fishing, water sporting, or recreating on land, or just literally hungry for a bite to eat, visitors can make purchases for a variety of needs on site. Before going on outdoor excursions, visitors will be able to stock up on equipment and provisions at the outdoor supply store. For boat and water sports rentals, tour guide and driver hires, boating supplies, repairs, and fuel, the marina can meet visitors' needs before and after heading out to the lake. 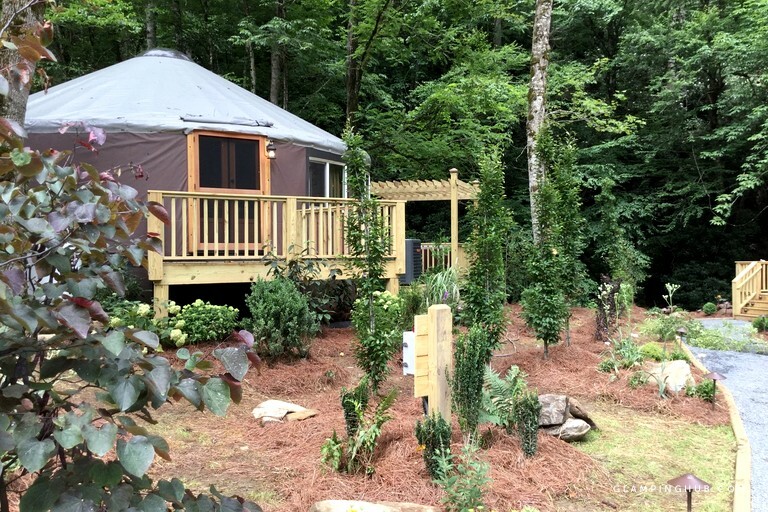 Located in Topton, North Carolina, deep inside Nantahala National Forest, this yurt site is situated near the 30-mile shoreline of Nantahala Lake, surrounded by winding creeks, deep gorges, towering water falls, the Great Smoky Mountains, and half a million acres of forest. The Appalachian Trail and Bartram Trail run through the surrounding area, along with numerous other hiking trails in the vicinity. The lake and nearby creeks provide ample opportunities for water sports, boating, and fishing. 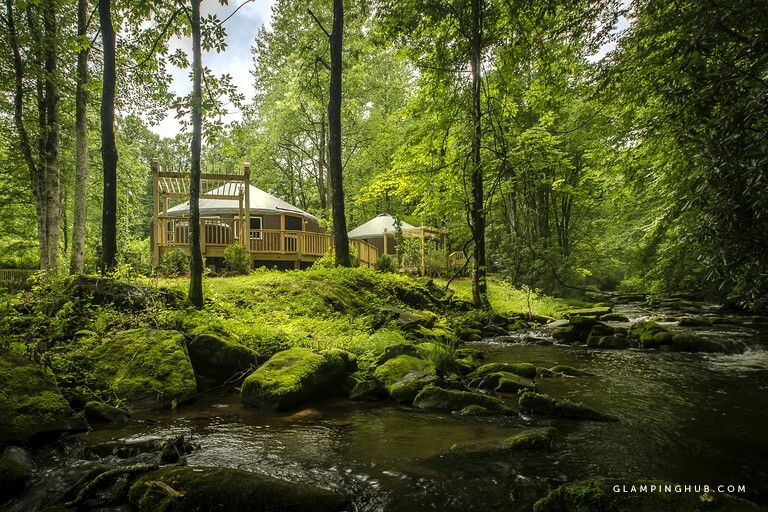 Within an hour's drive, visitors can also go on trips to the Great Smoky Mountains National Park and the Nantahala Gorge, one of the nation's premier whitewater rafting rivers. 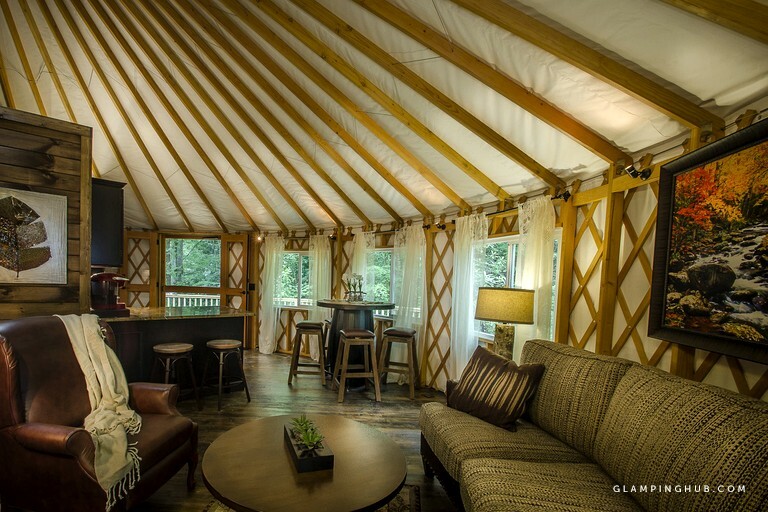 A vast, natural paradise awaits outside the door, perfect for both unplugging and adventuring in the wild. 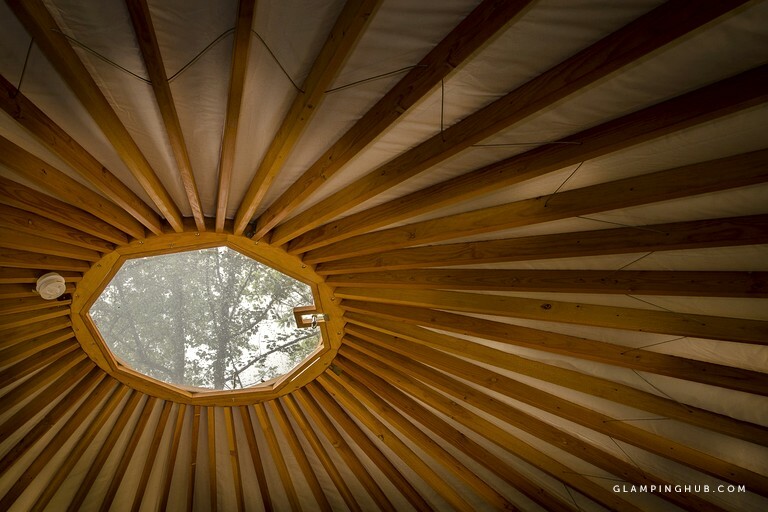 At the same time, however, the conveniences of civilization are not too far away. About 18 miles to the east, the town of Franklin offers various options for fine dining, antique shopping, art gallery visits, and museum tours. The towns of Andrews, Robbinsville, and Bryson City are also nearby, and the Cherokee Indian Reservation is about an hour away. The opportunities for outdoor adventure are nearly endless, both on land and on water. On land, visitors can go hiking in the surrounding Nantahala National Forest or the nearby Joyce Kilmer Forest, Great Smoky Mountains National Park, Bartram Trail, and Appalachian Trail. Besides hiking, there are a number of other ways they can explore the landscape—from zip-line tours, canopy tours, and Jeep tours, to horseback riding, mountain biking, and driving along the Mountain Waters Scenic Byway. On water, visitors can rent pontoon boats, fishing boats, ski boats, canoes, and kayaks, as well as go wake boarding, jet skiing, and rafting, with both guided and unguided trips available from local companies. For a more low-key outing on the lake, visitors can go on a dinner cruise. The lake is also a prime location for fishing, with many species of fish, including trout, bass, sunfish, crappie, salmon, and walleye. For shopping and dining, visitors can go to a nearby general store, fishing equipment store, rustic market, and various restaurants, as well as the on-site outdoor supply store, cafe, and grill. For entertainment and edification, they can take advantage of a number of golf courses, the Smoky Mountain Center for the Performing Arts, the Andrews Twin Cinema, the Ruby City Gem Museum, the Macon County Historical Society Museum, and the Great Smoky Mountains Railroad. At the Cherokee Indian Reservation, visitors can step back into time to experience traditional Cherokee culture at Oconaluftee Indian Village and learn more about it at the Cherokee Indian Museum. For those who want to try their luck, Harrah's Cherokee Casino Resort awaits as well. 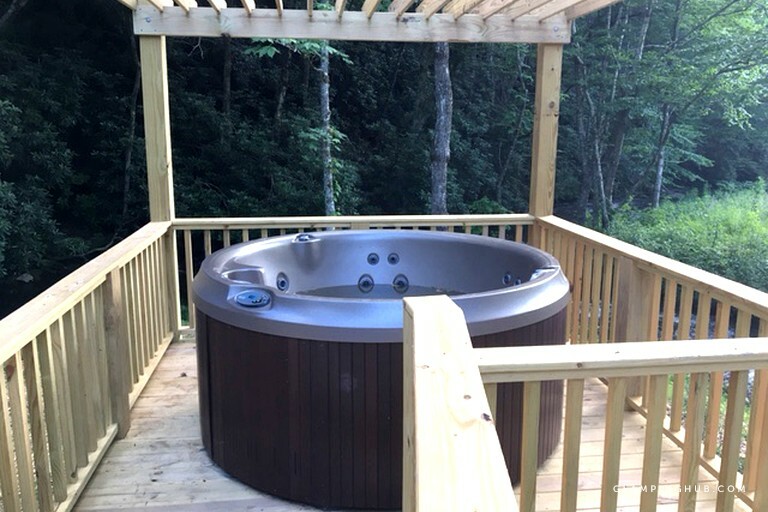 There is a $200 refundable damage deposit due at the time of booking and it will be returned within five days of guests' departure as long as there is no damage done to the accommodation.